The Society for the Anthropology of Food and Nutrition is pleased to announce the winners for our annual Christine Wilson prize. This prize goes to outstanding research papers by undergraduate and graduate students writing from the various perspectives embraced by Society, including nutrition, food studies and ethnography. This year we received submissions from the United States, the United Kingdom, Australia and Brazil. All the submissions were excellent. SAFN Vice President Amy Trubek organized the whole process this year and deserves our gratitude for a job well done, along with all the readers of the papers. It is time, by the way, to start thinking about next year. We encourage submissions for next year’s prize (due July 1, 2017). See the links above for details. Today we are announcing our undergraduate prize winner. We will announce the graduate prize winner tomorrow. The awards will be formally presented at the annual meeting of the American Anthropological Association, this week, in Minneapolis! Please attend the SAFN reception, award ceremony, and distinguished speaker event on Saturday evening (11/19) to learn more about the winners and the awards. That will start at 7:45pm in room 101A. My name is Cynthia Baur and I am from Greensburg, PA. I graduated from Dickinson College in May 2016 with a BA in Anthropology with a self-declared focus in Nutritional Anthropology. My research interests developed while taking a course of the same title during my sophomore year. It was during my sophomore year that I also began working at the Dickinson Farm as a student farmer. My interest in farming continued into the following summer when I travelled to Tanzania with the Dickinson Anthropology Department to participate in an ethnographic field school in which I studied subsistence farming. During my junior year I added to my cross-cultural food experience by studying at the Umbra Institute in Perugia, Italy through food studies program. In my senior year I delved into the local food movement in Carlisle by becoming a board member for the local farmers’ market and by becoming a work-share member at a nearby farm. I am currently an apprentice at the Dickinson Farm and next year I will be continuing on as a second year apprentice. In this paper I critically analyze the local food movement in Carlisle, Pennsylvania and the surrounding area. I argue that the local food movement is a response to a global, industrialized neoliberal food system. Consumers seek out a more personal alternative to anonymous industrially produced food. 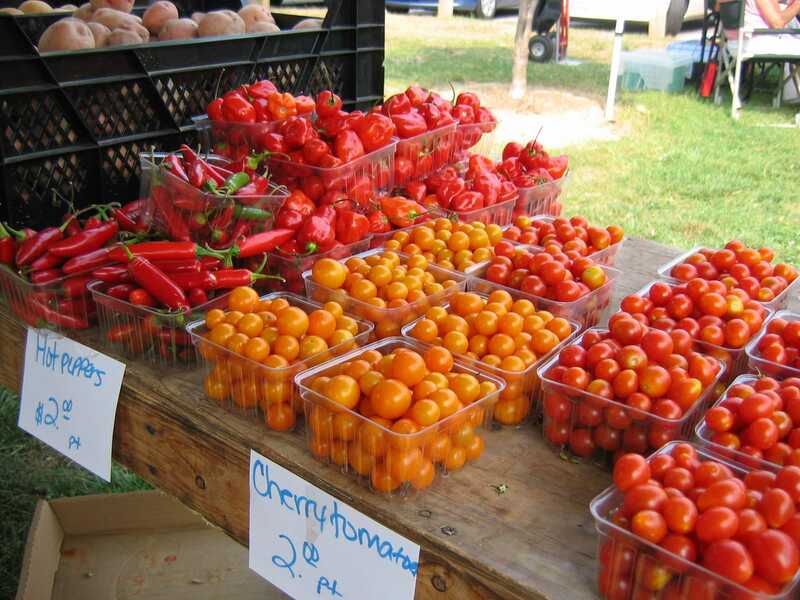 I use my own ethnographic work, such as interviews with farmers and participant observation at the farmers’ market, to understand the motivations of participating producers and consumers in Central Pennsylvania. I find that the local food movement in this area is not successful at giving all consumers access to local, healthy, and sustainable food. Individual participants are responding to a call to “vote” with their dollars to try to create change that will alter the entire food system. However, they are unsuccessful because they are acting within their individual capitalist identities. In addition, not all consumers have an equal opportunity to “vote” and the rhetoric often ignores certain components of food production, such as labor, adding to the elitism of the movement. Participants need to recognize the privilege and elitism that exists within the movement. While the local food movement may be unsuccessful at meeting all of its goals on its own, it is still a valuable component of a multi-level strategy for creating change within the food system. Are student activists transforming campus dining? And, if they succeed, what are the implications for the way Americans think about food? We recently posted an article by Bonnie May, David Burley and Kellen Gilbert, of Southeastern Louisiana University, about efforts by students there to convince their university administration and Aramark (their food service contractor) to source more food locally. They have been building ties to local farmers, organizing a farmers market on campus and working to get Aramark to stock the campus salad bar with local produce. However, Aramark actively resisted these ideas and even took actions that undermined the students’ and farmers’ efforts. Even though SLU is located in a very productive agricultural region, with a long growing season and many farmers eager to work with the university, students eating on campus have very little access to local food. This is true on university campuses all over the country. But there has also been a great deal of student activism around food, resulting in a growing commitment to local food by some colleges and universities. In perhaps the biggest move in this direction, the California State University system announced this week that 20% of the food on its 23 campuses will, by 2020, meet the standards of the Real Food Challenge (visit the site for details on those standards). The Cal State system is very large, with 447,000 students and 45,000 faculty and staff, spending over $100 million annually on food. This could prove to be a big enough move to catch the attention of companies like Aramark. One of Aramark’s competitors, a company called Bon Appetit, already promotes itself as providing a sustainable alternative food service. Their presence on campuses is probably evidence of successful student activism. The movement for “real food” on campuses is more complicated than simply sourcing food from local producers. Students, faculty, and staff on campuses around the United States have long debated the quality of the food provided by food services. This has included an interest in food perceived to be healthier than had been offered in the past. But activists have also pushed for food that is more environmentally sustainable, which can mean a lot of different things, including local sourcing of ingredients. It might include food that reflects the local culinary culture, for example. Some have suggested cooperating with local restaurateurs, caterers, and food truck operators to increase the variety of dining options on campus and to encourage local business development. Organizing students to grow food on campus has also been a popular idea. What does this all mean? It might be tempting to suggest that this is merely a kind of consumerist fight. After all, college is expensive and students are the customers. If they don’t like what they are getting, they have a right to demand something else. Yet that is not really how the fight is framed. Rather, students involved in these campaigns draw on ideas about health, about the environment, fairness (to workers, farmers, and fishers) and about local business. The movement is clearly connected with food activism in other segments of American society. It may represent a challenge to the corporate logic that has come to dominate higher education in recent years. It would be interesting to hear from SAFN members about their experiences of student food activism. Is food a target for student activism where you work? 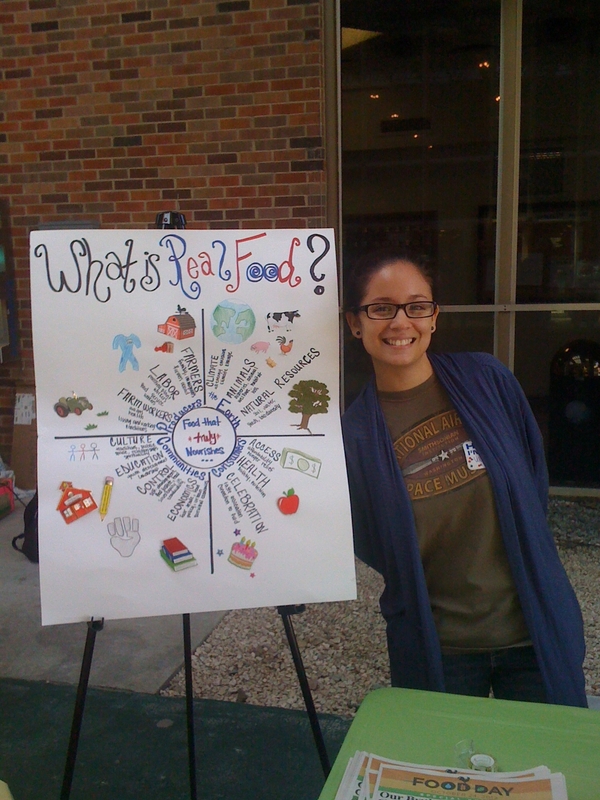 SLU students promoting real food. 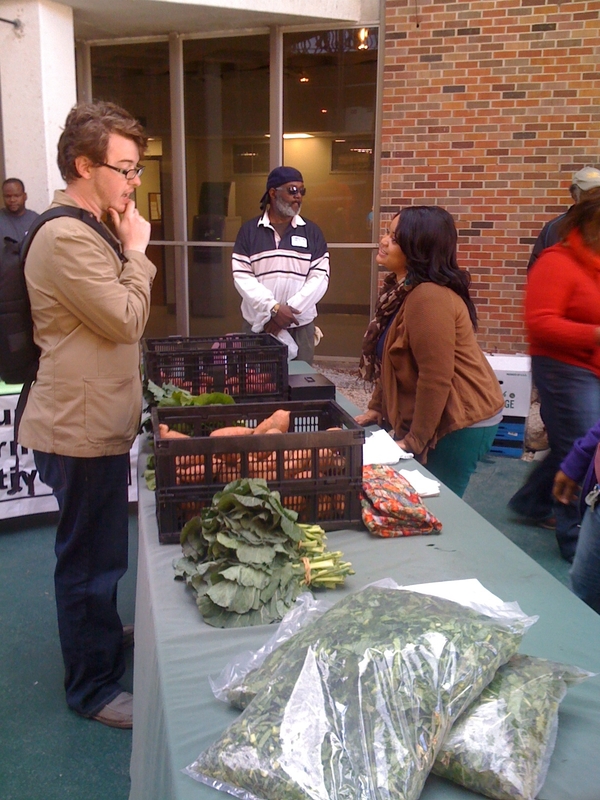 Our students challenged the University administration and local Aramark dining managers to source more food directly. They started by bringing the Aramark manager and the leaders of the local farmers’ cooperative together to develop a plan in which the farmers could regularly deliver sustainable, seasonal produce for the campus cafeteria’s salad bar. The farmers were excited about the possibilities—not only connecting more with students but also opening up a new market for their produce. This was a small step, but one both the students and the farmers were convinced could be successful, with potential for growth. Then, inexplicably, Aramark ceased contact with Reconnect. The students continued to send emails to the dining manager and other personnel, but, still, no response. At the same time this was happening, Aramark’s corporate headquarters issued a national directive forbidding communication with university students affiliated with the Real Food Challenge. Aramark did indeed get involved. The morning of the farmers market, as the farmers were unloading produce and setting up, Aramark set up their own table. Right next to the Indian Springs Farmers Cooperative farmers, the dining manager and campus chef handed out brochures highlighting the “local” food they serve and their corporate policy on sustainable practices. They also handed out free fruit and vegetables. The farmers and students of Reconnect felt this directly undermined their effort and goals. Instead of cooperating with students, the corporate dining service at our university chose to dismiss a student-led initiative that would not have cost them, and in fact might have enhanced their image of ecological responsibility. In the meantime, the salad bar in the cafeteria continues to feature tomatoes shipped from Mexico, onions from Washington and iceberg lettuce from California. Two years after the vicious spike in food prices, global food prices are once again on the rise. Are we going to see another food crisis? The current rise in prices stems largely from the prospects of a lower than expected wheat harvest in Russia, the consequence of high temperatures and drought. The reduced demand attracts speculators who further push up the prices. Supply is further reduced when nations implement export bans. In response to an imminent poor harvest, today Russia imposed a ban on exporting grains. By shutting the door on exports, nations hope to keep the food in country to feed their citizens. This was a strategy adopted by several countries during the 2008 food crisis, which placed further upward pressure on prices. By disallowing exports, the global grain supply suddenly gets a lot smaller with no concomitant change in demand, and prices rise. When Russia decided to ban grain exports prices reacted predictably: they soared to their highest levels in two years” reaching “the highest level since August 29, 2008”. August 2008 is notable because it marks the height of the 2008 global food crisis, the food price index for cereals reached a whopping 238 (compared to 167 in August 2007, and 85 in 2000). Russia did not just ban exports on wheat; corn, barley, rye and flour were also banned from export, with predictable impacts on corn and other grains: Today corn futures shot to a 13 month high. It is likely that fertilizer will also increase in price as declining yields drive increased fertilizer applications. Things do not (yet?) look as dire as 2007/8 and some will (again) benefit from the price increase. US wheat farmers, for instance, will likely gain as prices for their exports increase and rural producers in low-income countries may as well. But, the global poor could again suffer and those at the margins of poverty could be driven over the edge. Even small increases in food prices translate into human suffering. The International Fund for Agricultural Development estimates that a one percent increase in the price of staples results in 16 million more food insecure people in the world. A rise in food prices so close on the heels of the last price spike also threatens those households that are still rebuilding their livelihoods. The causes of the 2007/8 crisis and the current price increase do not entirely overlap. The conversion of grains to fuels is thought to have been a driving force in the 2008 food crisis, for instance. Speculation in agricultural futures markets however may be a common factor. The role of hoarding and speculation in the 2008 food crisis has been widely debated, with mixed evidence on its role. Some suggest that the role was minimal, while others believe speculation and hoarding played significant roles. (Fredrick Kaufman has written a wonderful piece on this for Harpers called The Food Bubble: How Wall St starved millions and got away with it, available in full, alas, only to subscribers.) The current rapid price increase, however, seems to be unambiguously driven by speculation. This is a situation to watch closely, especially if other countries begin to impose similar export bans. It might also be a good time to revisit the issue of the commodification of food and to think on how we can avoid food price spikes. As nutritional anthropologists it might also be a time to think about how our work can contribute to policy debates and to the popular understanding of the local impacts of global market forces. The holy annual gathering of the American Anthropological Association will be in New Orleans this coming November. In anticipation, I will periodically post food-related information about the city where I live, work and eat that our readers can use when they are here. This is the first in that series. Back in pre-Katrina flood times, New Orleans had a few farmer’s markets (actually, if you go back far enough, the city had a remarkably large system of public markets, but that is for another post), the most notable being the system run by the Crescent City Farmer’s Market. This organization, founded in 1995, started out with one market and a few vendors from the city and the surrounding region. These markets became the place where, if I recall correctly, “rock stars shop and chefs are stars,” where, in other words, the people watching was, as is often the case in New Orleans, nearly as good as the food. The 2005 hurricanes and floods were a huge blow to farmers, fishers and other producers at the markets, but the organizers were back at it soon after the disaster. They proved to be among the most creative and resourceful groups working to help the city rebuild and innovate in the ensuing years. Rebranding themselves as marketumbrella.org, the organization turned itself into a juggernaut promoting new ideas about markets, food, economic development and sustainability in the United States and even internationally. They run three weekly markets in New Orleans (the Saturday morning market is an easy walk from the AAA conference site) and have helped establish many of the other markets in the city and region. I think we actually have more now than we did before the disaster. I recommend you visit the market when you are in town. But marketumbrella.org has some great resources you can check out even before you get here. The website itself has tools for people who organize markets, links to some astonishing videos (check out the Gar fishing video and all the other stuff on local seafood) and so many local and regional initiatives that it boggles the mind. Oh, and there is a picture of my daughter up there somewhere too. Last year the market published a cookbook, edited by local chef and culinary activist Poppy Tooker, The Crescent City Farmers Market Cookbook, which has great recipes (I’ve tried several) and even better stories (and won awards as one of the best New Orleans cookbooks in 2009). You can get lost in the site, but it may motivate you to get out there and transform your own local food system.